KENDRICK LAMAR: DAMN. - Exclusive RED Colored Vinyl (2-LP) - Free Shipping! Damn. 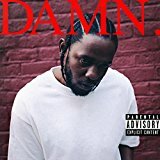 is ranked 3rd best out of 8 albums by Kendrick Lamar on BestEverAlbums.com. The best album by Kendrick Lamar is To Pimp A Butterfly which is ranked number 51 in the list of all-time albums with a total rank score of 41,362. Members who like this album also like: To Pimp A Butterfly by Kendrick Lamar, Good Kid, M.A.A.D City by Kendrick Lamar and A Moon Shaped Pool by Radiohead. Related links: top tracks by Kendrick Lamartop tracks of the 2010s, top tracks of 2017. Showing latest 5 ratings for this album. | Show all 903 ratings for this album. After the critical acclaim of "TPAB", everyone was curious about how Kendrick Lamar's next project would be welcomed. Without giving a too subjective opinion that would lead to debates without a winner, let's say that he still managed to bluff his world. Resolutely different thematically and musically, we can qualify "DAMN." of success. Kendrick Lamar knows how to be bold and knows how to accompany his audience. It must be admitted that "Damn." still seems less striking than his predecessor. Already because we are less surprised by the excellence which King Kendrick is forced, then because the choice of productions, less flamboyant, may mark less spirits. One thing is certain: Kendrick Lamar has taken a new dimension and has just made a new demonstration of its precedence in the game. Between surprise announcements, excellent album and magic clips, no doubt the good news has been announced: the King, here it is. Is it just me or does the production not hold up compared to TPAB? Kung Fu Kenny took the best of GKMC and TPAB and put it all together in DAMN. While it may not be as great conceptually, it still stands out among its contemporaries. I think TPAB and GKMC were significantly better (especially in production). Now that I'm actually putting in more listens to this album, I find it so frustrating that the songs that always get played from this album (DNA, Humble, Loyalty) really aren't the best at all. I'm not a huge fan of the production style here, but wow the last half of the album was thematically incredible. Great album, even if not the best of Kendrick Lamar. Pancada a sociedade, raps fortíssimos e batidas incríveis.